Deutsch / Amphenol DTM/ATM 8 way plug assembly, gray. Connector and Lock ONLY. Terminals not included. 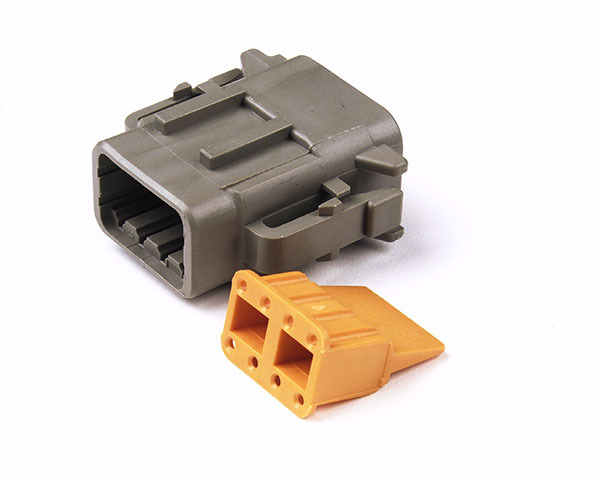 This plug connects to the NTK AFX, Ballenger Motorsports AFR500 and AFR500v2. Also used as the mating (harness side) connection to the ECM 1001A-2 Oxygen Sensor in the ECM AFM1500 AFR/O2/Lambda kit. Uses Female Size 20 contacts from Deutsch / Amphenol. The Deutsch / Amphenol DTM / ATM connection system is perfect for inline subharness connections, custom patch harnesses, sensor extensions, used in high temperature and high vibration environments.